NEW YORK (CNN) -- Perhaps he should be called Captain Phoenix? Captain America will return in a new comic book series July 1. Its title: "Captain America Reborn." 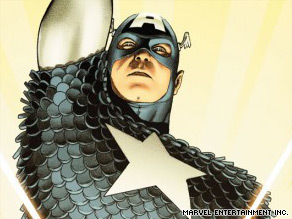 Rising from the dead after being killed off over two years ago, Captain America is being resurrected by Marvel Comics. Though the circumstances of his return are being closely shielded, the star-spangled superhero returns July 1 in a five-comic-book series, "Captain America Reborn." A big-budget movie in development by Marvel is also expected in 2011. After close to 60 years in print, Marvel Comics killed off Steve Rogers, aka Captain America, in 2007, one of its most famous and beloved superheroes, amid a controversial story line. He fought and triumphed over Hitler, Tojo, international Communism and a host of super-villains, but a sniper's bullet cut Captain America down in 2007, a move that shocked many of his fans. "The reaction was amazing," says Marvel Executive Editor Tom Brevoort. "It certainly was like the world went crazy for three days. Everybody had a point of view about it, including fans who hadn't read the comic for 30 years." In the comic series, Rogers was to stand trial for defying a superhero registration law passed after a hero's tragic mistake causes a 9/11-like event. Marvel said the comic story line was intentionally written as an allegory to current real-life issues like the Patriot Act, the war on terror and September 11. Rogers eventually surrenders to police. He is later mortally wounded as he climbs the courthouse steps. It was a violent and strange end for an American hero and icon. The primary shooter, Crossbones -- working under the orders of Captain America's longtime nemesis, the Red Skull -- was caught. The identity of a second shooter is revealed in issue 600, which goes on sale Monday. Many felt Captain America's death in 2007 was symbolic of the time. And his return now? "The tenor of the world now is when we're at a point where we want to believe in heroes. Someone who can lead the way," said Brevoort. "It just feels like the right time." Keeping superheroes dead and buried does not come easy. Even Superman, who was killed off by DC Comics in 1993, came back to life a year later. And what of Captain America's sidekick, Bucky Barnes? After taking up the shield and mission of Captain America for the past year, it'll be time to relinquish the mantle. Is there room for two sentinels of liberty? Stay tuned. Glenn Perreia contributed to this report.